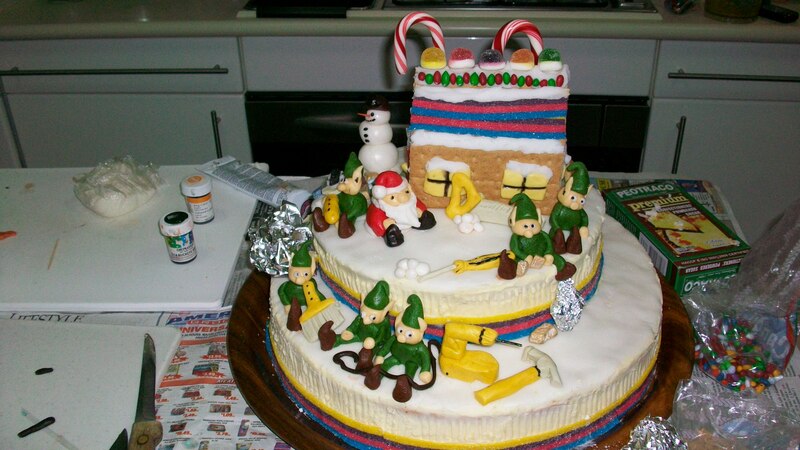 It’s the Christmas party at the Facilities Maintenance Dept today and Latham and I decided to make a cake. Christmas cake making used to be an annual tradition when my father was alive, as he loved fruit cake. 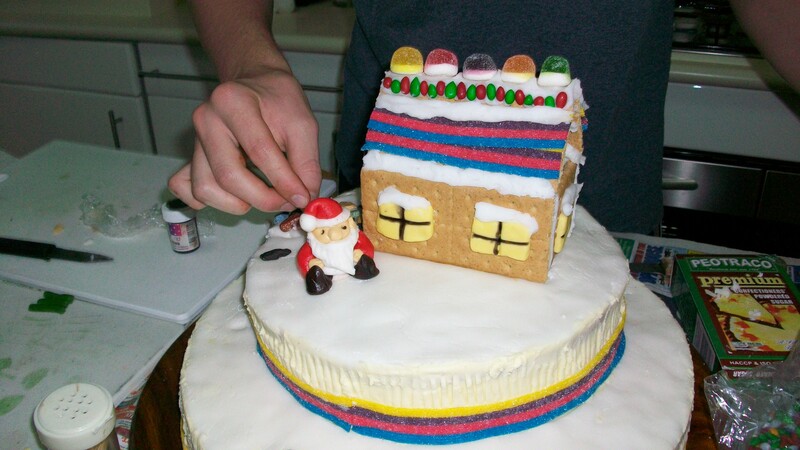 I would bake him one every year and spend a week decorating it with a different Christmas theme each time. Then every night through the holidays and long beyond, he would slice off a little bit of the fruit cake after dinner and slowly enjoy it until it was all gone. After he died, I had a small baby and no-one who truly loved it like he did…so the tradition mostly went away. But it did leave me with quite a few sugarcraft tricks and skills, and this week Latham and I decided to put them to use and make a cake for Robert’s department Christmas party. 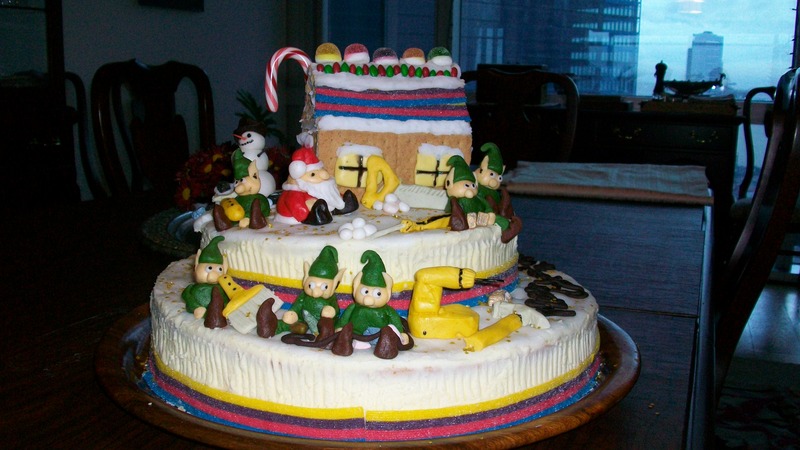 The theme was a natural: facilities maintenance elves helping to construct a gingerbread house for Santa. Latham was on it! He designed the house and was a real partner in making layout and construction decisions. We were a little limited on sugarcraft materials here in Manila, but were amazed what we could find in Gourdos, a gourmet cooking store across the street. Unfortunately there were out of glucose, an essential ingredient to make modelling sugarpaste. 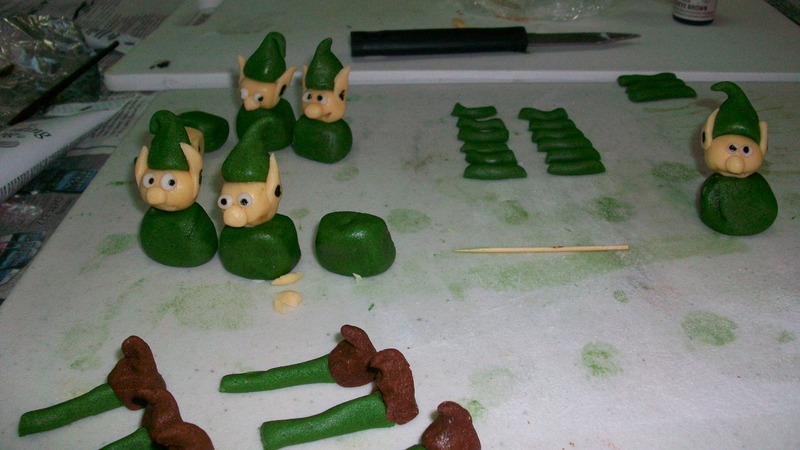 However, I found a stash from a wedding cake that I made a couple of years ago, and it turned out to be enough to make all the characters we needed. (Its amazing what got packed in those kitchen boxes!) We made power tools and screwdrivers, ladders and saws. We even found chocolate rocks so the elves could construct a footpath. I think we ended up with a very acceptable cake, but the most fun for me was that I got to do arts and crafts with my 16-yr old son again….it’s been a while! And unlike arts and crafts with little ones, he was there for the whole process from conception to finishing touches. Whoa! What talent! I love the elves – especially how you positioned the eyes to change expressions. Kudos to you and Latham! I was on head assembly but Latham did the eyes. Glad we only did six elves. Those babies take some time! Your talents never cease to amaze me! I’ve never seen anything like this. How did the everyone at the party like it? Thanks! It went very well. However it was pouring pouring with rain, and the party was by the pool. The humidity was too much for the cake after a while and it started to sweat and leak colour…but they liked it I think and everything went well. Quite a party too!